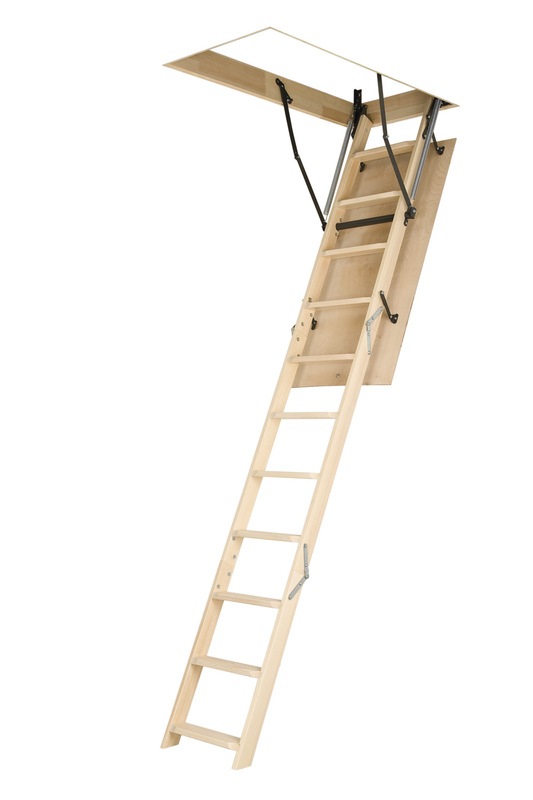 The FAKRO LMS attic ladder is a folding metal attic ladder where both hath and box are made of pine wood. The ladder itself is made of powder-coated metal RAL 7022. The beige hatch, 1 3/8in thick, is paintable to match the interior design. The unit is sealed with a peripheral gasket that lines the frame. The ladder's segment folding system and possibility to lock the door in fully open position ensure an ease of operating. The double hinges' joints and stringer's profile plugging guarantee high ladder's durability. The hatch hinge's corner prevents frame deformation. The visible side of the door is smooth. 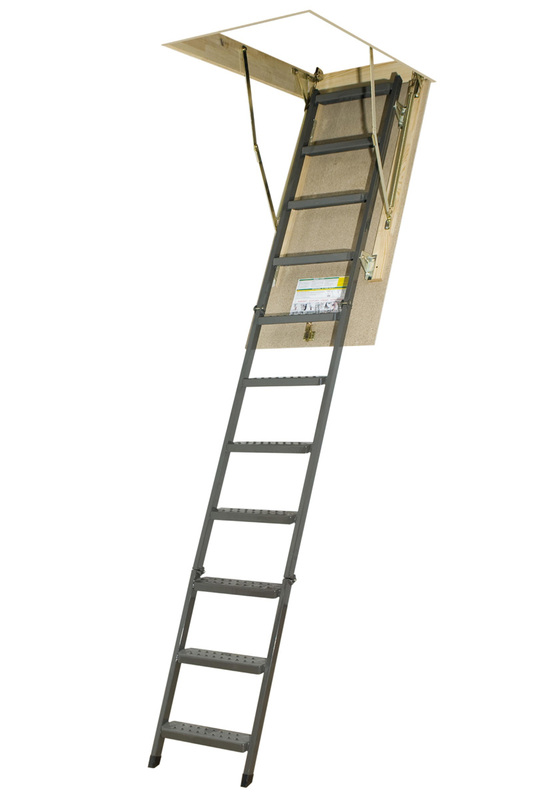 The FAKRO OWM attic ladder is a folding metal ladder with a paintable non-insulated particle board hatch door. 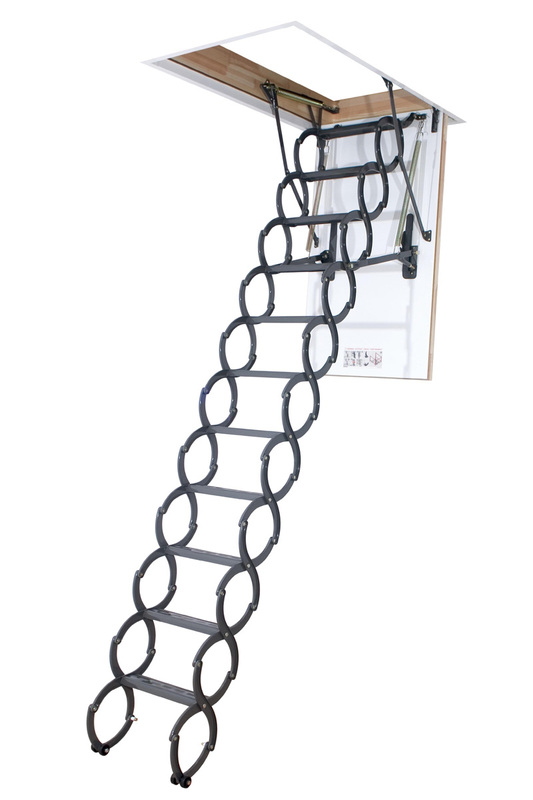 This model is mounted to the door with brackets that allow minor adjustments to the length of the ladder and the space between the ladder and door. The FAKRO OWM ladder is used in non-insulated spaces such as a garage or barn. One set of four FAKRO Installation brackets that help facilitate attic ladder installation in the ceiling. Compatible with all three-section folding Fakro attic ladders. The FAKRO LWN basic attic stairs model is a builder series folding pine wood ladder, with non insulated chipboard hatch door with smooth paintable surface. LWN model is a durable 250 LB load capacity ladder. As the ladder is being opened up the hinges automatically adjust the ladder away from the door to create a space between the ladder and the door, allowing immediate use of the stairs without any adjustments. Treads are fitted using dovetail joints for added durability. There is a space between the treads and the hatch door, for more comfortable foot positioning onto the treads. Safety grooves are cut into the treads to prevent slipping. Steps do not protrude over the ladder surface. Door support springs are coming down with the door to clear entrance to the attic. LWN attic stairs is a high quality ladder for common non insulated garage area. 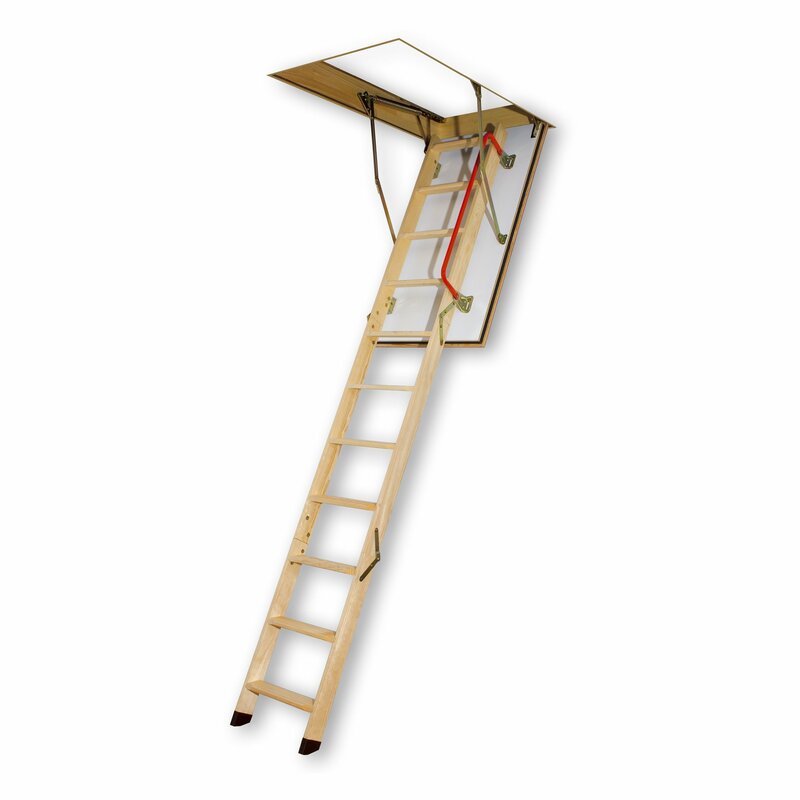 The FAKRO LST attic ladder provides an easy and safe access to the attic. The scissors' construction makes ladder folding possible. A 1 3/8" thick, white, finished wooden door with an R value 5.2 significantly reduces heat loss. A peripheral seal in the lower part of the box guarantees first-class tightness. The S-shaped strings give a modern appearance and perform the role of a handrail, facilitating climbing the ladder. 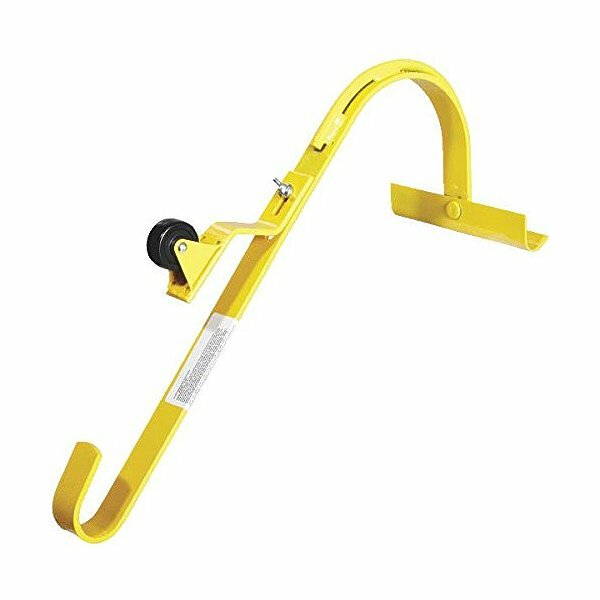 The scissors' system of folding the ladder and the possibility to lock the hatch in a fully open position ensure an ease and safety of operation. 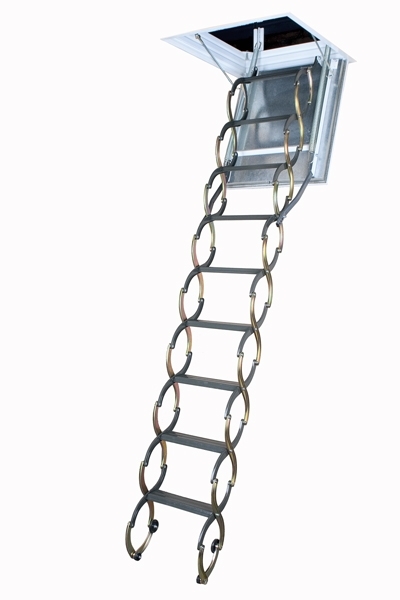 The small ladder dimensions, achieved thanks to the unique system of folding, allow the ladder to be installed in smaller openings. Safety is ensured by the application of rounded side supporters and remaining hardware which do not pose any risk of injury. The outer (visible) side of the door is smooth without any visible fixing elements. FAKRO LWT-66894 Wooden Folding Highly Insulated Attic Ladder 25"x54" FAKRO LWT-66894 Wooden Folding Highly Insulated Attic Ladder 25"x54"
The FAKRO LWT attic ladder model is a super-thermo insulated unit recommended for projects which stress energy-saving, especially due to heat loss (r-value 12.5). The LWT is an ideal unit for creating a barrier between a cool attic and the heated space below. It is finished white on both sides of the lid with no visible hardware once installed. Includes a lock closure and opening control rod. Fits rough openings 25" x 54" and ceiling heights 7'8" to 10'1". Fully assembled and ready to install. FAKRO LST-66875 Scissor Premium Attic Ladder 22.5"x31" FAKRO LST-66875 Scissor Premium Attic Ladder 22.5"x31"
The premium LST is a powder-painted, scissor attic ladder assembled from metal links. The LST is a scissor ladder with an insulated and sealed, white exterior door with no visible hardware after installation. Its construction takes up less space and requires less room to unfold, making it perfect for small spaces. There is the option of adding up to 2 additional LSS steps to bring the ladder height to 10 ft. 10 in. 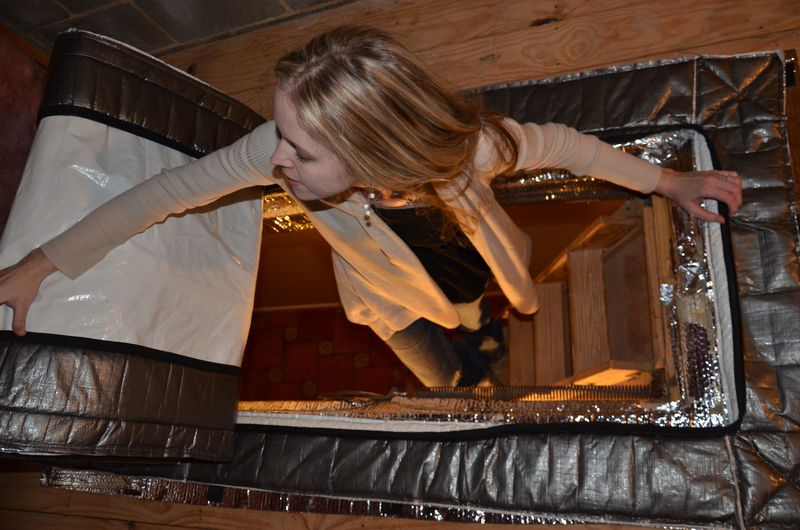 Springs run parallel with the door to make entry to the attic wider and more comfortable. The door is well balanced; it openings and closes easily with no sudden movements with a spring-loaded closure. An extendable opening rod, finishing trim, and LXK installation brackets are included. Fits rough opening 22.5 in. x 31 in. and ceiling heights 8 ft. 2 3/8 in. to 9 ft. 2 1/4 in. FAKRO LSF fire-rated scissor attic ladder provides easy access to the attic while functioning as a blaze block in case of fire. The hatch is manufactured with the use of fireproof materials and is equipped with a gasket that expands under extreme heat. The LSF ladder is fire-resistant at EI, 60 minutes as per EN 13501-2. To increase the length of the FAKRO LST Scissor ladders you can use up to 2 extra steps. Each step extends the ladder 8in. One step can be added to the FAKRO LST attic ladder bringing it to 9ft 10 1/8in or two steps can be added to the FAKRO LST attic ladder bringing it to 10ft 10in. Attic Zipper - attic stair insulator 24" x 54" x 13" Attic Zipper - attic stair insulator 24" x 54" x 13"
Attic Zipper: Installed easily around the attic stairs entry to prevent air leakage and energy loss. Made using three layers of insulative material: d420 nylon (white, inner layer); double bubble heat reflective shield (middle layer); extra thick polyurethane (outer layer); extra heavy duty YYK zipper. Standard and custom sizes available. FAKRO LST-66822 Scissor Premium Attic Ladder 22.5"x54" FAKRO LST-66822 Scissor Premium Attic Ladder 22.5"x54"
The premium LST is a powder-painted, scissor attic ladder assembled from metal links. The LST is a scissor ladder with an insulated and sealed, white exterior door with no visible hardware after installation. Its construction takes up less space and requires less room to unfold, making it perfect for small spaces. There is the option of adding up to 2 additional LSS steps to bring the ladder height to 10 ft. 10 in. Springs run parallel with the door to make entry to the attic wider and more comfortable. The door is well balanced; it openings and closes easily with no sudden movements with a spring-loaded closure. 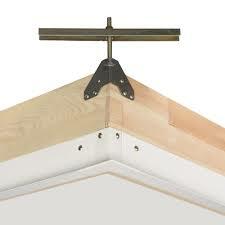 An extendable opening rod, finishing trim, and LXK installation brackets are included. Fits rough opening 22.5 in. x 54 in. and ceiling heights 8 ft. 2 3/8 in. to 9 ft. 2 1/4 in. The FAKRO LWF fire-resistant attic ladder provides an easy access to the loft performing at the same time the function of a blaze block in case of a fire inside the building. The hatch manufactured with the use of fireproof materials is equipped with an expanding peripheral seal which ensures tightness during fire. The LWF attic ladder possesses fire resistance of EI2 30 minutes. 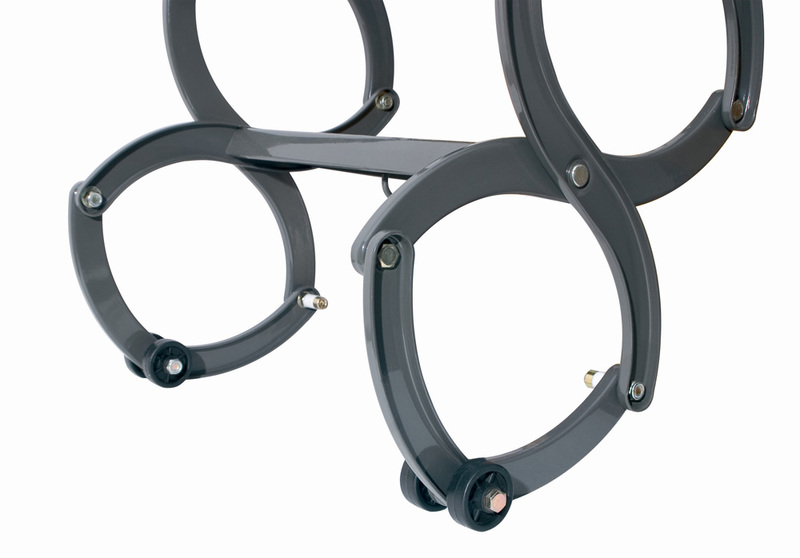 The peripheral seal positioned in the groove milled in the frame provides a first-class tightness. The ladder's segment folding system and possibility to lock the hatch in fully open position ensure an ease of operating. The using safety is ensured thanks to the application of rounded side supporters and remaining hardware which do not pose any threat of cutting. The outer (visible) side of the hatch is smooth without any visible fixing elements. ELITE II ALUMINUM ATTIC LADDER 375 Lb. 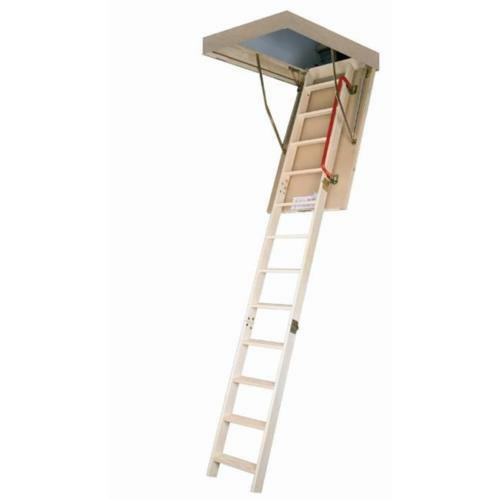 load capacity aluminum attic ladder 7 ft.11" minimum to 10 ft.3" max ceiling height Easy to pull down and put back up Has advanced cylinder design Features heavy-duty hinges, 3-1/4" deep steps Adjustable shoes Rough open ceiling: 22-1/2" x 54" Landing space: 69-5/16" - projection 79" AA2210 22.5X54 AL ATTIC LADDER SIZE:7 Ft.8"-10 Ft.3" WEIGHT:51 Lb. Attic Zipper - attic stair insulator 25" x 48" x 7" Attic Zipper - attic stair insulator 25" x 48" x 7"
CHAMPION SERIES WOOD ATTIC LADDER A wood attic ladder with working load limit - of 300 lbs. Fits Ceiling Heights: 7 Ft. Min - 8 Ft.9" Max Has reinforced steps - step size 5-1/2" Adjustable spring tension Easy to install - easy to pull down & put back Dimensions Rough Opening: 22-1/2" x 54" Approximate Landing Space 60-5/8" - Width 71" CS224P 22.5X54 WD ATTIC LADDER SIZE:7' to 8'9" WEIGHT:64 Lb. 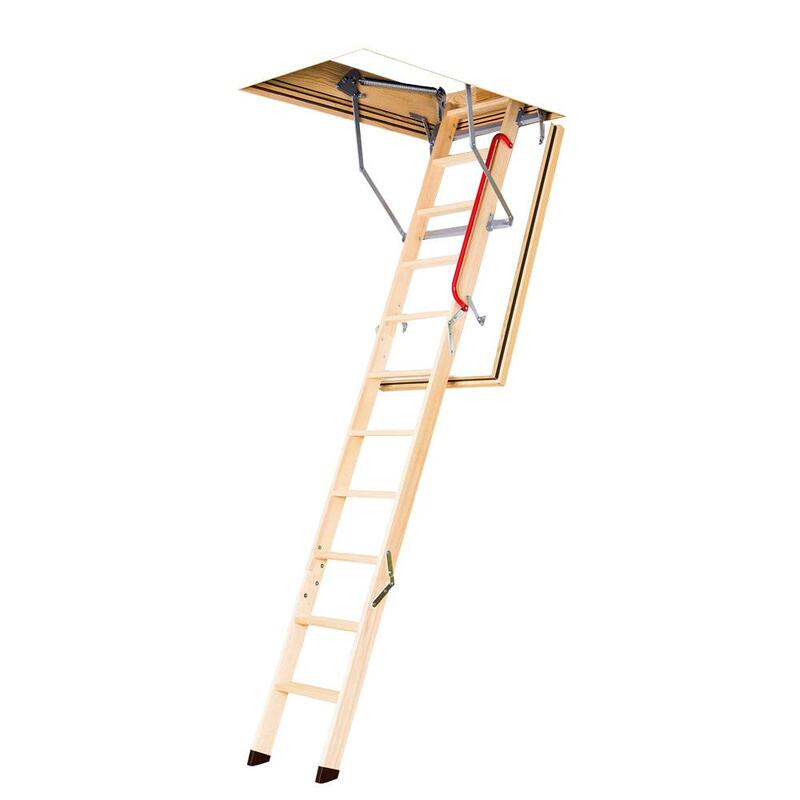 FAKRO LWT-66893 Wooden Folding Highly Insulated Attic Ladder 22.5"x54" FAKRO LWT-66893 Wooden Folding Highly Insulated Attic Ladder 22.5"x54"
The FAKRO LWT attic ladder model is a super-thermo insulated unit recommended for projects which stress energy-saving, especially due to heat loss (r-value 12.5). The LWT is an ideal unit for creating a barrier between a cool attic and the heated space below. It is finished white on both sides of the lid with no visible hardware once installed. Includes a lock closure and opening control rod. Fits rough openings 22.5" x 54" and ceiling heights 7'8" to 10'1". Fully assembled and ready to install. 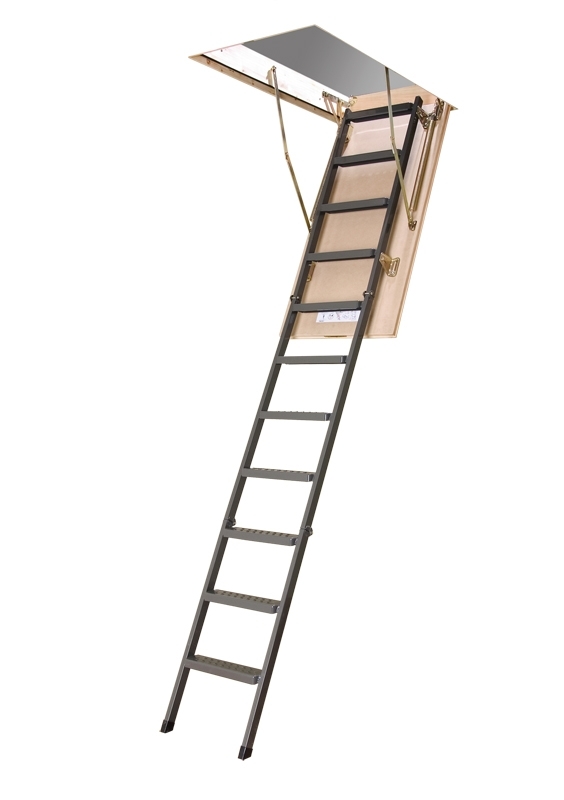 CHAMPION SERIES WOOD ATTIC LADDER A wood attic ladder with working load limit - of 300 lbs. Fits Ceiling Heights: 8 Ft.9" Min - 10 Ft. Max Has reinforced steps - step size 5-1/2" Adjustable spring tension Easy to install - easy to pull down & put back Dimensions Rough Opening: 22-1/2" x 54" Approximate Landing Space 69-5/16" - Width 79" CL224P 22.5X54 WD ATTIC LADDER SIZE:8 Ft.9"- 10 Ft. WEIGHT:70 Lb. Attic Zipper - attic stair insulator 30" x 60" x 13" Attic Zipper - attic stair insulator 30" x 60" x 13"